In vitro studies form a pivotal role in dental research contribution to a substantial evidence base. The reporting standards of these studies are not uniform thus resulting in lacunae in evidence reported. The effort of this concept note is to propose a Checklist for Reporting in vitro Studies (CRIS guidelines) that would promote quality and transparency in reporting in vitro studies. Adhesive systems are selected based on their bond strengths achieved while testing in laboratories. These bond strengths can predict the longevity of a restoration to some extent. There were several discrepancies in the reported bond strengths. To critically review the reliability of macro-bond strength tests used to evaluate resin-tooth interface. Relevant literature published between January 1983 and May 2013 was collected from PubMed database, Google scholar, and hand-searched journals of Conservative Dentistry, Endodontics and Dental materials. Variables that influence the test outcome are categorized into substrate-related factors, factors related to specimen properties, preparation of specimens, and test methodology. Impact of these variables on the test outcome is critically analyzed. There is lack of a standard format for reporting the bond strength tests, which could lead to misinterpretation of the data and bonding abilities of adhesives. Introduction: The aim of the study is in vitro evaluation of the shear bond strength of composite resin bonded to enamel which is pretreated using acid etchant and Er,Cr:Ysgg. 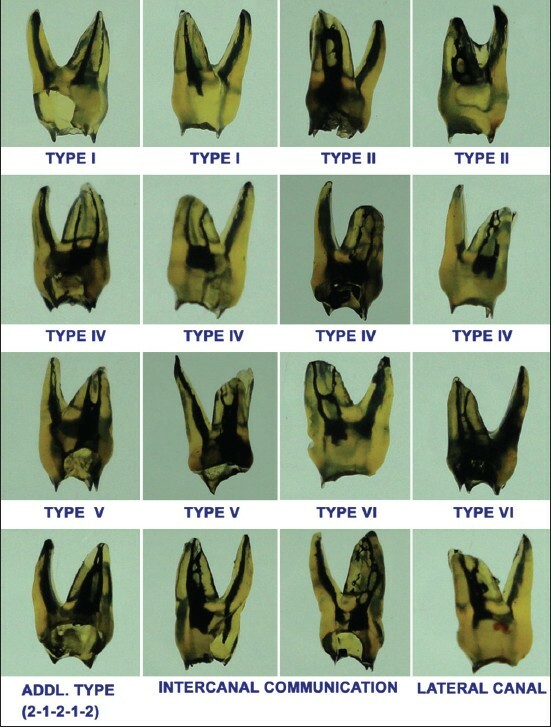 Materials and Methods: 40 extracted human teeth were divided in two groups of 20 each (Groups A and B). In Group A, prepared surface of enamel was etched using 37% phosphoric acid (Scotchbond, 3M). In Group B, enamel was surface treated by a an Er, Cr: YSGG laser system (Waterlase MD, Biolase Technology Inc., San Clemente, CA, USA) operating at a wavelength of 2,780 nm and having a pulse duration of 140-200 microsecond with a repetition rate of 20 Hz and 40 Hz. Bonding agent ((Scotchbond Multipurpose, 3M) was applied over the test areas on 20 samples of Groups A and B each, and light cured. Composite resin (Ceram X duo Nanoceramic restorative, Densply) was applied onto the test areas as a 3 × 3 mm diameter bid, and light cured. The samples were tested for shear bond strength. Results: Mean shear bond strength for acid-etched enamel (26.41 ± 0.66MPa, range 25.155 to 27.150 MPa) was significantly higher (P < 0.01) than for laser-etched enamel (16.23 ± 0.71MPa, range 15.233 to 17.334 MPa). Conclusions: For enamel surface, mean shear bond strength of bonded composite obtained after laser etching were significantly lower than those obtained after acid etching. Background: Consumption of certain acidic beverages may alter the physical and esthetic properties of resin composites. Aim: The aim of this study was to evaluate the effects of two sports beverages on color stability of two different types of resin composites polished with different composite polishing systems. Materials and Methods: A total of 96 disk-shaped specimens (diameter: 8-mm and thickness: 2-mm) were made from two different resin composites (Cavex Quadrant Universal-LC, and Clearfil-APX). All of the specimens were stored in distilled water for 24 h at 37°C. Color measurements of each specimen were performed using a colorimeter according to the CIEL*a*b* color scale at baseline and after seven days of immersion in two different sports beverages (Powerade and Buzzer). 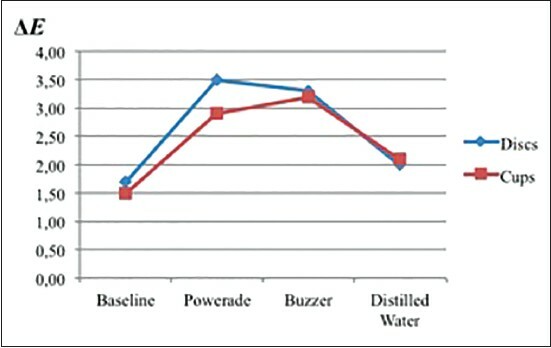 Statistical Analysis Used: The data were evaluated using Kruskal Wallis and Mann-Whitney U tests. Results: Significant differences were found between the mean ΔE values of the groups after seven days of immersion (P < 0.05). The highest level of the mean color change was observed in the Clearfil APX specimens immersed in Powerade (ΔE = 3.5 ± 0.9). Control groups stored in distilled water for both composites exhibited small color changes (ΔE-Cavex-bur = 2.1 ± 1; ΔE-Clearfil APX-bur = 2.1 ± 0.4). Conclusion: Sport beverages caused discoloration in the resin composites after seven days. Objectives: To evaluate the efficacy of 35% orthophosphoric acid, 24% ethylenediaminetetraacetic acid (EDTA) and 10% citric acid in the removal of smear layer from retrocavities prepared with ultrasonic retro-tips using scanning electron microscopy. Materials and Methods: Root canals of fifty single-rooted teeth were cleaned, shaped, and obturated with gutta-percha and AH plus sealer. The apical 3 mm of each root was sectioned with a diamond disc and retrograde cavities were prepared with Kis # 1 ultrasonic retro-tips to a depth of 3 mm. Retro cavities in Group I were treated with a gel of 35% orthophosphoric acid for 15 seconds, Group II were treated with a gel of 24% EDTA at neutral pH for 2 minutes, and Group III were treated with a gel of 10% citric acid for 2 minutes, followed by 1 minute rinsing with distilled water for all groups. The samples were prepared for scanning electron microscopic observation. Scoring was performed for the presence of the smear layer on the walls of the retrocavity. Results: In the orthophosphoric acid group, it was observed that all dentinal tubules were open in 70% of the samples. 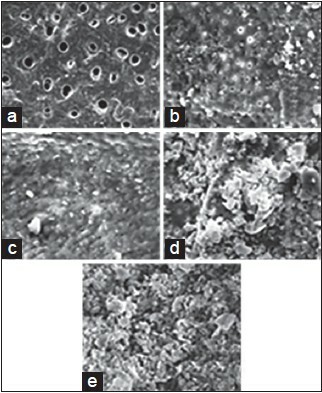 The majority of analyzed samples in EDTA and citric acid group showed dentinal tubules covered with the smear layer. Conclusions: Application of 35% orthophosphoric acid gel for 15 seconds on retrocavities prepared with ultrasonic retro-tips is the most effective means for removal of smear layer. Aim: To analyze the sustained release of intracanal medicaments with or without a carrier and testing their antimicrobial efficacy in root canal against Candida albicans and Enterococcus faecalis. 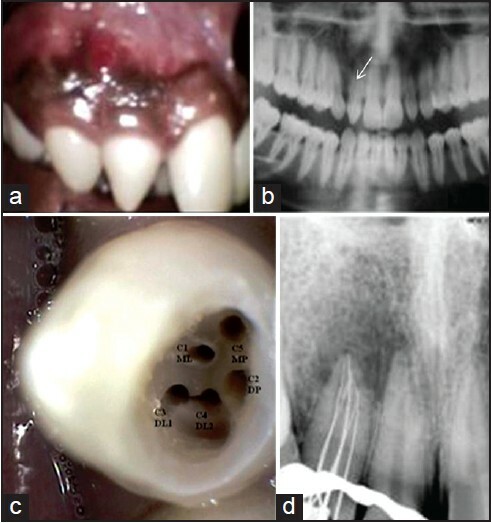 Materials and Methods: A total of 80 single-rooted anterior teeth were selected, root canal preparation was done, and teeth were divided into two halves and contaminated with C. albicans and E. faecalis, which were further divided into four test groups each according to intracanal medicaments used. Chitosan was used as vehicle for triple antibiotic paste (TAP) and calcium hydroxide and antimicrobial assessment was performed on second and seventh day. Dentine samples were collected after each time intervals and the number of colony-forming units (CFUs) was determined. Results : All four medicaments used in this study showed antifungal and antibacterial activity. Group II (TAP + chitosan) and Group III (Ca(OH)2 + chitosan) had the higher antifungal and antibacterial activity compared with two other groups. Conclusion: Combination of TAP + chitosan and Ca(OH)2 + chitosan produced better results compared with the combination of medicaments with saline. 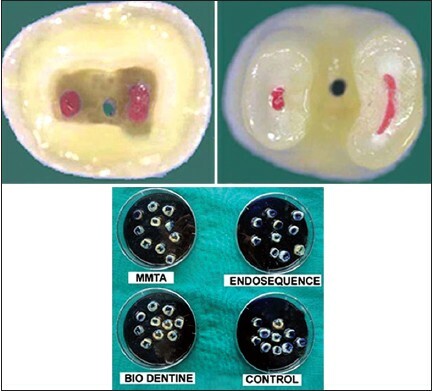 Aim: To evaluate the sealing ability of MICRO-MEGA Mineral Trioxide Aggregate, Endosequence, Biodentine as furcation repair materials using a dye extraction leakage method. Materials and Methods: Forty mandibular molars were randomly divided according to the material used for perforation repair. Group I- (left unsealed) control, Group II-MICRO-MEGA Mineral Trioxide Aggregate, Group III - Endosequence, Group IV - Biodentine. All samples were subjected to orthograde and retrograde methylene blue dye challenge followed by dye extraction with 65% nitric acid. Samples were then analyzed using Ultra violet (UV) Visible Spectrophotometer. Statistical Analysis: One-way analysis of variance (ANOVA), Tukey-Kramer Multiple Comparisons Test. Results: Biodentine showed highest dye absorbance, whereas Endosequence showed lowest dye absorbance when compared with other repair materials. Conclusion: Within the limitations of this study, it was observed that Endosequence showed better sealing ability when compared with other root repair materials. Background: Evaluation of microleakage is important for assessing the success of new restorative materials and methods. Aim and Objectives: Comparative evaluation of microleakage in Class II restorations using open vs. closed centripetal build-up techniques with different lining materials. 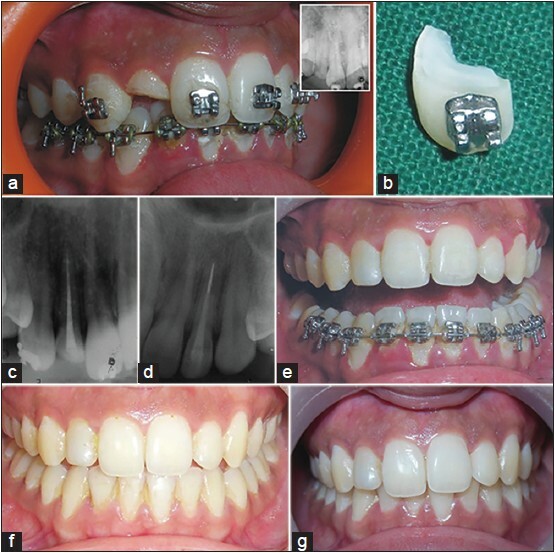 Materials and Methods: Standardized mesi-occlusal (MO) and distoocclusal (DO) Class II tooth preparations were preparedon 53 molars and samples were randomly divided into six experimental groups and one control group for restorations. Group 1: Open-Sandwich technique (OST) with flowable composite at the gingival seat. Group 2: OST with resin-modified glass ionomer cement (RMGIC) at the gingival seat. Group 3: Closed-Sandwich technique (CST) with flowable composite at the pulpal floor and axial wall. Group 4: CST with RMGIC at the pulpal floor and axial wall. Group 5: OST with flowable composite at the pulpal floor, axial wall, and gingival seat. Group 6: OST with RMGIC at the pulpal floor, axial wall, and gingival seat. Group 7: Control - no lining material, centripetal technique only. After restorations and thermocycling, apices were sealed and samples were immersed in 0.5% basic fuchsin dye. Sectioning was followed by stereomicroscopic evaluation. Results: Results were analyzed using Post Hoc Bonferroni test (statistics is not a form of tabulation). Cervical scores of control were more than the exprimental groups (P < 0.05). Less microleakage was observed in CST than OST in all experimental groups (P < 0.05). However, insignificant differences were observed among occlusal scores of different groups (P > 0.05). Conclusion: Class II composite restorations with centripetal build-up alone or when placed with CST reduces the cervical microleakage when compared to OST. Objectives: Activation of mineralization process in periradicular tissues following the injuries, is important in repair mechanisms. The objective of this study was to investigate the effects of CEM cement on survival and mineralization of human mesenchymal stem cells (hMSCs) and compare it with MTA. 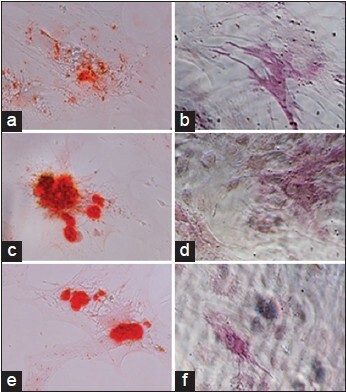 Materials and Methods: hMSCs that were planted on test material extracts and culture media were the experimental and control groups, respectively. The cytotoxicity of these materials was investigated using Methyl thiazol tetrazolium assay. After 7 days, alizarin red staining, alkaline phosphatase (ALP) assays, and qRT-PCR were used to assess the mineralization, expression of ALP, and gene expression (collagen type 1 and osteocalcin), respectively. The results were evaluated by ANOVA analysis and multiple comparisons test. P < 0.05 was considered as statistically significant. Results: Cell viability was not significantly different. Alizarin red and alkaline phosphatase staining showed mineralization in all three groups. In qRT-PCR, the expression of collagen type 1 is not significantly different among the three groups. Osteocalcin gene expression was significantly higher in the CEM group compared to the control (P < 0.05). Conclusion: CEM cement has acceptable toxicity and could induce mineralization process and enhance osteocalcin gene expression which is associated with mineralization in hMSCs. Aims and Objective: To investigate the root canal configuration of permanent maxillary first molar in Khasi population of Meghalaya. 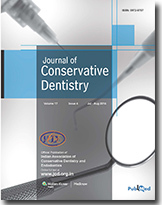 Material and Methods: Sixty (60) permanent maxillary first molars collected from patients of Khasi population of Meghalaya were studied using canal staining and clearing technique. Observations of the number of roots, root canal configuration, lateral canal, apical delta, and presence of the additional type of canals were made. 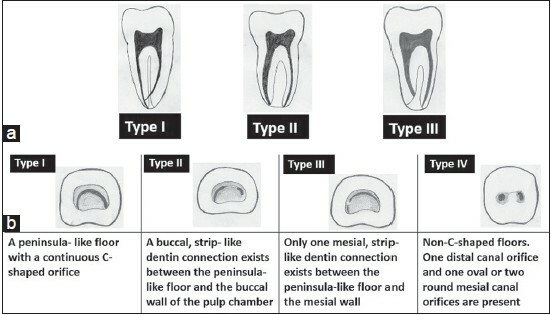 Results: Based on Vertucci's classification the different types of canal identified are: Mesiobuccal root, Type I (28.3%), Type II (28.3%), Type IV (30.0%), Type V (5.0%), Type VI (6.7%), and an additional type of canal (2-1-2-1-2; 1.7%) were observed. The distobuccal root displayed Type I (95%), Type II (1.7%), Type V (3.3%). The most prevalent canal configuration in the palatal roots is Type I (98.3%), Type II (1.7%). Conclusion: In Khasi population of Meghalaya, the most prevalent root canal configuration in the mesiobuccal root is Type IV followed by Type I and Type II. 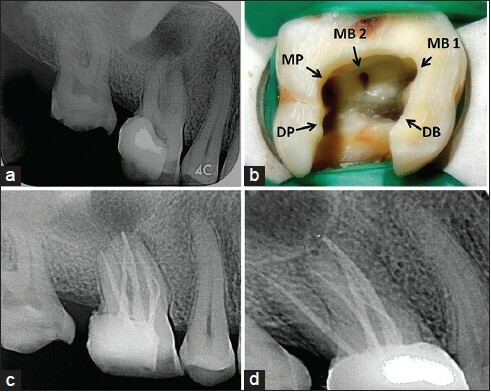 MB2 canals are present in more than 65% cases. In palatal and distobuccal roots, Type I configuration is present in most cases. Racial divergence may be responsible for such variations. Aim: The aim was to evaluate and compare a novel polyamide polymer based obturating system and Gutta-percha and sealer in filling simulated lateral canals and their homogeneity when used for obturating the root canals. Materials and Methods: A total of 60 freshly extracted human single rooted teeth with fully formed apices were selected for this study. Teeth were de-coronated, and roots were standardized to a working length of 15 mm. Root canal preparation was carried out with rotary Protaper file system in all groups. The specimens were then randomly divided into three groups A, B, and C (n = 20). Ten samples from each group were decalcified and simulated lateral canals were made at 2, 4, and 6 mm from the root apex. Remaining ten samples from each group were maintained calcified. Group A was obturated with SmartSeal system (Prosmart-DRFP Ltd., Stamford, UK). Group B was obturated with sectional backfill method. Group C was obutrated with cold lateral compaction method (control). Decalcified samples from the respective groups were analyzed with digital radiography and photography and the measurement of the linear extension and area of lateral canal filling was done using UTHSCSA (UTHSCSA Image Tool for Windows version 3.0, San Antonio, TX, USA) software. 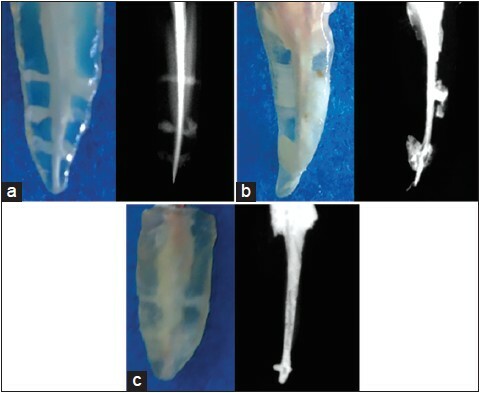 Calcified samples were subjected to cone beam computed tomography image analysis sectioned axially. Results: Group A 92.46 ± 19.45 showed greatest extent of filling in lateral canals and denser homogeneity of oburation, followed by Group B 78.43 ± 26.45 and Group C 52.12 ± 36.67. Conclusions: Polyamide polymer obturation proved to have greater efficiency when compared with Gutta-percha system, when used for obturation with regards to adaptation of the sealer and penetration into the simulated lateral canals. Aim: The aim was to assess, in vitro, the effect on surface abrasivity of enamel surface caused by three different types (flat trim, zig-zag, bi-level) of toothbrush bristle design. Materials and Methods: Twenty-four freshly extracted, sound, human incisor teeth were collected for this study. The enamel slab was prepared, which were mounted, on separate acrylic bases followed by subjected to profilometric analysis. The surface roughness was measured using the profilometer. The specimen were divided into three groups, each group containing eight mounted specimens, wherein, Group 1 specimens were brushed with flat trim toothbrush; Group 2 brushed with zig-zag and Group 3 with bi-level bristle design. A commercially available dentifrice was used throughout the study. A single specimen was brushed for 2 times daily for 2 min period for 1 week using a customized brushing apparatus. The pre- and post-roughness value change were analyzed and recorded. Statistical test: Kruskal-Wallis test and Mann-Whitney U-test. 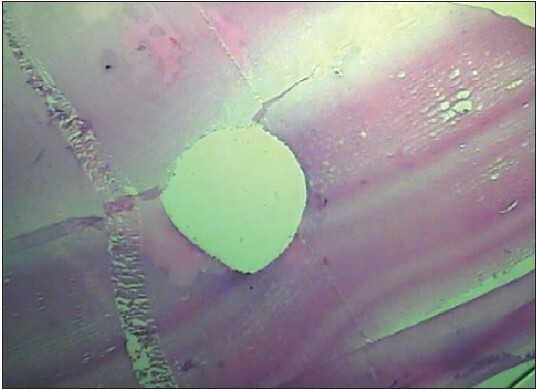 Result: The results showed that surface abrasion was produced on each specimen, in all the three groups, which were subjected to brushing cycle. However, the bi-level bristle design (350% increase in roughness, P = 0.021) and zig-zag bristle design (160% increase in roughness, P = 0.050) showed significantly higher surface abrasion when compared with flat trim bristle design toothbrush. Conclusion: Flat trim toothbrush bristle produces least surface abrasion and is relatively safe for use. Aim and Objective: The aims were to evaluate the root canal debris removal after irrigation with EndoVac system and to compare its efficacy with Max-i-Probe needles. Materials and Methods: Fifteen matched pairs of single canalled vital teeth with mature apices indicated for extraction were selected. After working length determination and biomechanical preparation, the teeth in the right quadrant were irrigated with EndoVac system and with Max-i-Probe needles in the left quadrant using 3% NaOCl and 17% ethylenediaminetetraacetic acid. Teeth were extracted and marked at 1 and 3 mm from working length and decalcified in Kristenson's solution. Stained histologic slides were observed under trinocular research microscope. Wilcoxon signed-rank test was used for statistical analysis. The statistical significance was set at P < 0.05 and the analysis was performed using SPSS version 11.0 software. Results: No statistical significant difference was found at 3 mm level between the groups. Group I had significantly less debris at 1 mm level. Conclusion: EndoVac performed better in removing debris from the apical thirds of root canals. This case report describes endodontic treatment completed in a peg-shaped maxillary lateral incisor, with single root and five root canals of which, one is due to dens invaginatus. Cone beam computed tomogram scanning confirmed the unique morphology of the tooth. New nomenclature for the five canals is proposed. The prevalent notion about maxillary central incisor with normal external morphology is a tooth with single root and root canal. A case in which all four maxillary incisors were having Type II canal configurations (Vertucci's classification) is reported, in addition, the lateral incisors revealed dens invaginatus with a Type I pattern as suggested by Ohler's classification and a large periapical lesion was seen in relation to the right lateral incisor. The diagnosis was confirmed with the aid of spiral computed tomography (CT) and canals obturated. Nonsurgical healing of the lesion was assessed by reviewing the case at prefixed intervals of time. The morphological variation in the number of roots and root canals, especially in multi-rooted teeth is a constant challenge for diagnosis and successful endodontic therapy. Knowledge of the most common anatomic characteristics and their possible variations is fundamental. Although, endodontic management of four-rooted mandibular first molars have been observed on a few occasions in the literature, to the best of our knowledge four-rooted mandibular second molars having two mesial and two distal roots have not been reported. 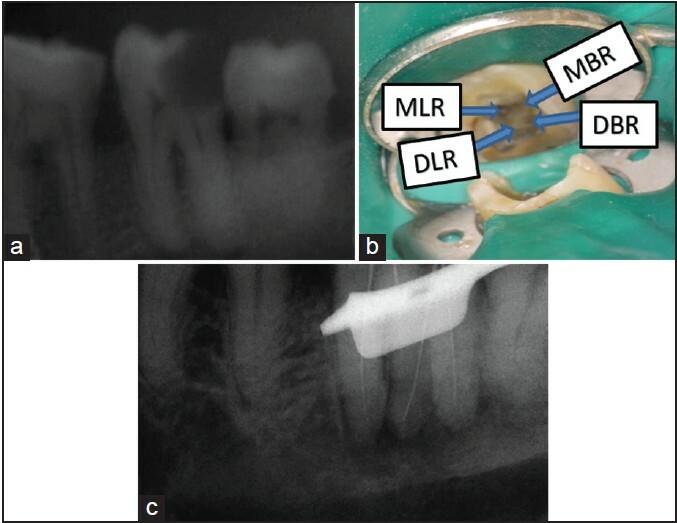 This paper highlights endodontic management of mandibular second molar with four roots (two mesial and two distal) with one canal in each root and its cone beam computed tomography (CBCT) evaluation which was primarily done for post treatment assessment for diagnosing post-endodontic complications, at the same time confirmed our radiographic diagnosis of this variation. This also helped us portraying the anatomy of this rare variation. Dental hard tissue trauma is among the most common cases encountered in dental practice. Simple tooth fractures, which occur due to sharp blows, are widely seen in all age groups, especially in young adults. If in case of complex fractures the fractured tooth fragments are available to the dentist in a clean and hydrated state, reattachment of the tooth fragment is the most conservative and biological treatment option possible. Cases of enamel and dentin fractures not involving pulp are treated by reattaching the fragment with adhesives and composite resin. However, fractures involving the pulp require reinforcement by quartz fiber posts and resin luting cement. In cases of fractures extending subgingivally, an envelope flap helps to achieve the desired isolation and visibility. 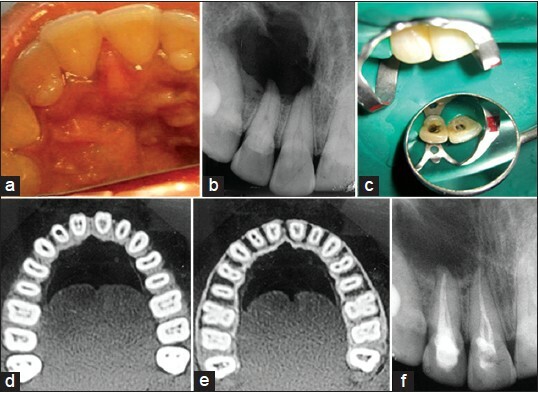 This article presents 2 case reports of reattachment of fractured tooth fragments. The first case showing a 4-year success was treated without raising a flap. The second case with a subgingival fracture was treated by raising a flap. Reattachment is the most economical, biologically acceptable and esthetic restorative option for dental trauma. Incomplete horizontal fractures occur in teeth with developing root as it cannot withstand traumatic force during injury. Diagnosis and management of such cases are difficult. Cone Beam Computed Tomography (CBCT) served as efficient diagnostic tool and follow up measure and the use of Mineral Trioxide Aggregate in treatment had shown a better prognostic importance. In present case, treatment outcome of one year is reported in incompletely fractured mid-root of central incisor and the clinical approach is discussed. It is crucial for any clinician to have a thorough knowledge about the normal anatomy of tooth and always be vigilant for any variations to ensure endodontic success. An anatomic variant like additional canals in the palatal root of maxillary molar is not commonly reported. This clinical case report presents the application of cone beam computed tomography as a useful imaging technique in endodontics for the management of teeth with aberrant anatomy. Here, maxillary first molar having two canals in the palatal root, two canals in mesiobuccal root and one canal in distobuccal root was managed successfully using cone beam computed tomography scan as a diagnostic aid.